Great find! I've been wearing a lot more bright colors lately. Love this tank! So glad Forever 21 has this! Oooh, really cute! I love adding more brightness to my closet. I must say Splendid--their knits are sooo soft! So great to see this at Forever 21. I notice Target has a maxi dress with this sleeveless look, too. For basic staples, I'd def. 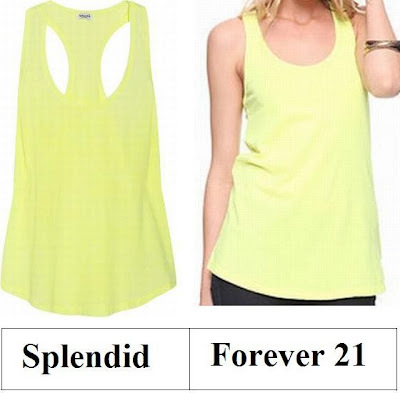 go with the F21 one! Big fan of racerback tanks! Hope you've been well, E! Catching up on your blog now. I'd stick with the F21 option. More and more, I've been complimenting people on items that turn out to be from Forever 21. I haven't been in a long time; I think I need to make a trip for some summer pretties! Bright coloured tanks are gorgeous. They'll go so well with brightly coloured trousers as well. I love the F21 one. The colour is more subtle. I like the forever 21 piece. Oh I always love these tank tops! They look really cute tucked in sometimes :) And you can't beat F21 prices! Splendid is a great brand but for a layering staple like this I'd buy the cheaper one! $44 for a yellow T-Shirt. Ridiculous. oh i love the colour..it's just as fresh as lemon..
Gotta go with F21 -- what a great color! I'm really rocking the layered tanks this summer! Great find! And my day is def being fueled by coffee after drafting my extensive post today, last night! So tired!! PS you should enter my giveaway it ends soon! For Ever 21 Definitely! that place is the best. Some things I can save money on and not cry about it, other, like shoes .... I just can't. i seriously haven't been to F21 in such a long time! i should go there for more simple summer tops like this one. I'm all over the F21!